The iconic British singer passed away on Sunday (10Jan16) following a secret 18-month battle with cancer, with his representative confirming the news on Monday (11Jan16). It's now been reported the 69-year-old star has already been laid to rest, with no further public ceremony planned. "There is no public or private service or a public memorial. There is nothing," a source told Britain's The Mirror newspaper. An insider added: "In many respects you don’t need a memorial or service to remember David by... You have his music instead. He would have wanted to just disappear with no fuss, no big show, no fan-fare. This would totally be his style. His last album Blackstar was very much his goodbye to fans instead." 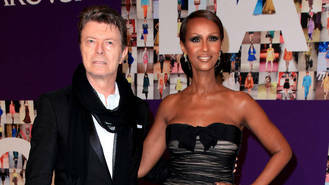 It's suggested Bowie spoke to his model wife Iman about his desire for no fanfare following his death. He was reportedly clear that he didn't want a lavish ceremony, instead stating he should only be remembered for his music. Bowie's final record, Blackstar, was released on Friday (08Jan16) - the same day he turned 69, with his producer Tony Visconti explaining it was meant to be a "parting gift" to his fans. In the recently-released video for his single Lazarus he's seen writhing on a hospital bed, before he disappears into blackness. Although it appears there will be no public funeral for the star, his life will be honoured in other ways. There will be a tribute to him at the BRIT Awards in London, UK, in February (16), and a memorial concert will be held at New York’s Carnegie Hall on 31 March (16). The exact details of the musician's death haven't been confirmed yet, but there are reports he was suffering from liver cancer. His good friend Visconti has suggested the star thought his life would be longer, and he was even planning to make more music public. According to the businessman, Bowie spoke to him a week before his passing to discuss making another record. "At that late stage, he was planning the follow-up to Blackstar and I was thrilled and I thought, and he thought, that he'd have a few months, at least," he told Rolling Stone. "Obviously, if he's excited about doing his next album, he must've thought he had a few more months. "So the end must've been very rapid. I'm not privy to it. I don't know exactly, but he must've taken ill very quickly after that phone call."